Today Queen Letizia was at the Palace of Congresses and Exhibitions of Galicia, in Santiago de Compostela city to commemorate the World Red Cross Day and Red Crescent Day and presented the Gold Medals to the volunteers and staff. World Red Cross and Red Crescent Day is celebrated on May 8, coinciding with the birth of Henry Dunant, its founder. The philanthropist and Swiss businessman Henry Dunant was on a work trip in Algeria when he decided to travel to Solferino to meet Napoleon III. On June 24, 1859, just after his arrival, the war between the Austrian and Franco-Piedmontese army began. The fight ended with almost 40,000 wounded or dead. Henry Dunant organized the civilian population to help the combatants, in addition to buying the necessary equipment and creating field hospitals. Under the motto ‘Tutti fratelli’ (We are all brothers), he managed to get all the wounded treated, without considering his side or condition. The following month, Dunant returned to Switzerland to write ‘A Souvenir of Solferino’, a story published three years later. 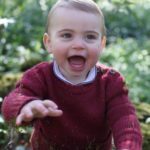 These ideas won the acceptance of the President of the Geneva Society for Public Welfare, who convened a small committee to examine the proposals of the philanthropist. The International Committee of the Red Cross was officially founded on February 17, 1863, coinciding with the first meeting of this group of experts. The International Committee of the Red Cross has won the Nobel Peace Prize three times, in addition to the Balzan Prize and the Jaime Brunet International Prize. On June 13, 2012, the Red Cross was also awarded the Prince of Asturias Award for International Cooperation. Today’s event was dedicated to the reflection on the influence of the Environment on the living conditions of people. 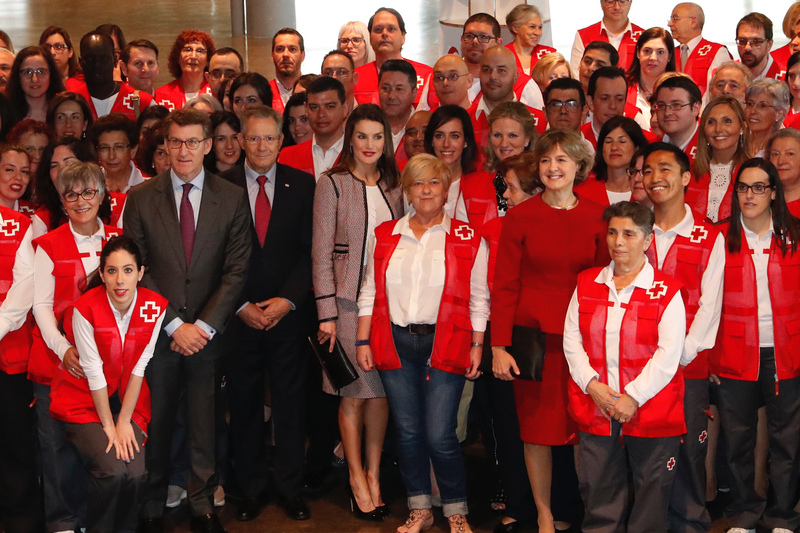 The Gold Medals of the Spanish Red Cross are the main distinctions granted by the humanitarian organization to recognize social commitment and solidarity work. The event started with a video presentation “Committed to the environment and with people” that explains the working of the organization. Then the gold medal winners were announced who received the honors from Her Majesty. Speaking at the event Queen admired the work being done by the staff and volunteers of the Red Cross. The act finalized with a musical performance in charge of the School of Gaitas of Pontevedra. 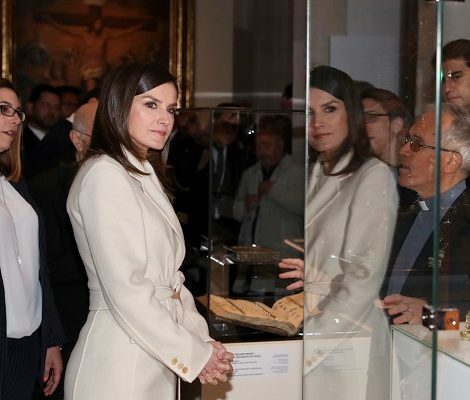 Once again bringing her thrifty woman out, the 45-year old Queen Letizia chose to recycle her wardrobe. 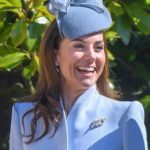 She wore the HugoBoss Skirt suit that was debuted at world Rare Diseases Day in March this year. The ensemble contains BOSS ‘Keili’ Collarless Blazer and the matching ‘Meili’ Skirt. 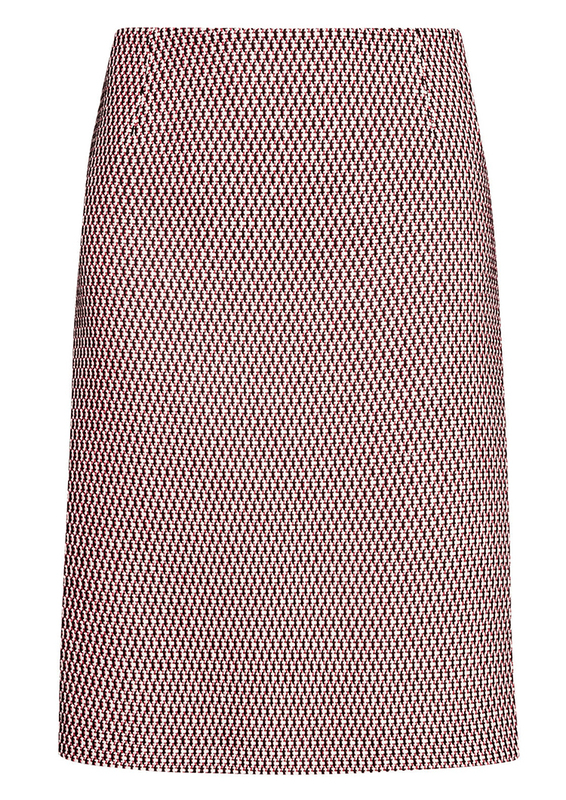 The tweed suit features a micro-pattern in pink and black and belongs to the fall / winter 2017 collection. 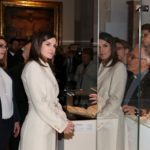 Underneath the blazer, Letizia wore a white silk blouse I assume from the same label. Letizia paired the look with Carolina Herrera accessories. 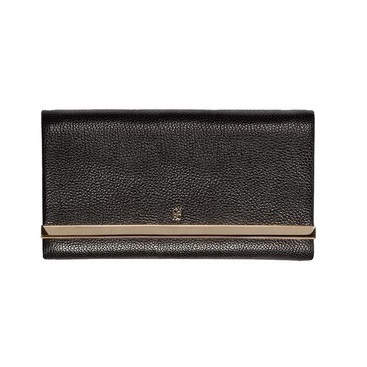 She was wearing CH leather salons and carried Astrud clutch. Her white gold and earrings studded with diamonds and ruby finished the look.